Separating walls and floors between adjoining residential dwellings are subject to Building Regulations – Part E1. However, pre-completion sound tests (to verify compliance) only apply where access to the adjoining dwellings can be enforced by Building Control, which, typically, excludes dwellings outside the project’s jurisdiction. Internal walls within dwelling-houses and flats, between bedrooms and between a bedroom and a water closet, as well as internal floors, are subject to Building Regulations – Part E2. However, pre-completion sound tests (to verify compliance) do not apply, notably, because ‘flanking transmission’ (typically, via internal doors) would, in most cases, skew results. 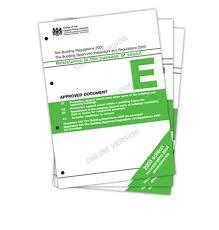 Rather, Building Control issue Part E approval on the basis of laboratory test certificates, i.e. where the partitions installed conform to a certificated system, tested to perform to the requisite acoustical standards, within a suitably accredited, laboratory environment. The airborne and impact sound insulation values required to satisfy Building Regulations – Part E1 & E2 are not weighted against background noise levels. Therefore, they do not take into account the potential masking effect of ambient sound. Accordingly, dwellings built, for example, in quiet rural locations are required to meet the same standards as those built in busy towns and cities. This entry was posted on Thursday, June 30th, 2016 at 10:56 am	and is filed under Soundproofing News. You can follow any responses to this entry through the RSS 2.0 feed. Both comments and pings are currently closed.